Unfortunately, <?xml:namespace prefix = st1 ns = "urn:schemas-microsoft-com:office:smarttags" />Australia was settled by the English who brought their northern temperate practices to a drought-prone country. So, we see acres of lawn, northern hemisphere plants, and trees that require extra water above what the climate can supply. The result is billions of litres of precious water are used to pander to these practices, whereas local Australian plants would have sufficient sustenance from natural rain. It is difficult to argue against the Prime Minister of Australia's Federal Government entering the debate with their 10 billion dollars to buy back water rights from farmers and taking over the river system from the states with the exception of Victoria. Although Australia's climate is highly variable - in some areas the rainfall can be as high as 1200 millimetres per year and other areas almost nil - the lesson is clear: Australians have to learn to live with drought. 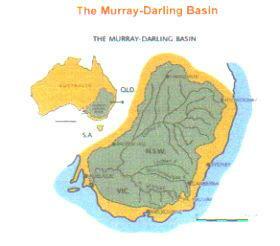 The Basin is defined by the catchment areas of the Murray-Darling and its many tributaries. It covers an area of 1.05 million square kilometres or 14% of Australia. It covers four states and the Australian Capital Territory and covers three quarters of New South Wales, two thirds of Victoria, 15% of Queensland, 8% of South Australia and the entire Australian Capital Territory. 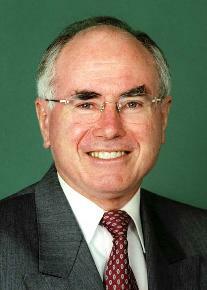 The Murray-Darling is the longest river system in Australia and ranks fifteenth in the world. The Basin contains more than twenty major rivers as well as important ground water systems. It is so large it covers cool and humid rainforests, temperate mallee country, and inland sub-tropical areas, hot, dry semi-arid and arid lands. Two million people live, work and depend on its water supply. Industry and natural resource businesses output for the region is in the vicinity of 10 billion dollars per year. The river is now in a sorry plight with flows drastically reduced in the worst drought in a hundred years. But it's not only the drought that has caused the problem, too much water has been sold to business leaving nothing for environmental flows to flush out the river. If we were giving a lesson on how to stuff up a river basin, all we'd need to do is show our students the once mighty Murray. The effect on birds and animals and the dead trees along the depleted river course is heartbreaking. Federal and State Governments are expending millions of dollars in drought assistance to farmers and industries that rely on the rural industry. Much of Australia's farm areas have been declared Exceptional Circumstances areas, which allows the farmers to apply for drought assistance. Farm incomes are drastically reduced. Some farmers have no income except for Government assistance. In the cities water restrictions apply with some limiting water sprinklers operation to 3 hours, one day a week. Hand-held hoses fitted with a trigger nozzle can only be used before 8am and after 8pm. Cars can only be washed from a bucket and so on and so on. Industries that require vast amounts of water are encouraged along rivers that sustain them at great cost to these waterways. Even worse, some industries pollute these steams making the situation tragic. Many governments and departments are doing what they can to encourage better water use but the example set in the past is one of, I don't care there's plenty of water, look at the River Murray. The time has come for Australians to forget the extravagance of the past and address the land and rivers of today and make sure they don't commit the sins of their fathers. The use of grey water and recycling must be encouraged, together with rainwater tanks in the cities. Alternatives found for gardens and lawns that don't require the vast amounts of extra water above what the climate provides. This terrible drought should be a lesson about what can be done in the future. Australia must learn the lessons and plan for a future that doesn't require the wrecking of our rivers to sustain it. The criteria should be if the climate and natural rain won't support it, don't do it. Drought breaking rains have been received in some parts of Australia and when these terrible times end, and the rains return prosperity to the country, let us not forget the lessons of the drought.